Staten Island, New York celebrates completed $5.6 million renovation of "The Big Park"
On July 5, 2018, NYC Parks Commissioner Mitchell J. Silver joined NYC Department of Environmental Protection’s (DEP) Senior Advisor for Strategic Planning Mikelle Adgate, New York State Assembly Member Michael Cusick, New York City Council Member Debi Rose, Staten Island Deputy Borough President Ed Burke, representatives from Community Board 1 and community members to cut the ribbon on the newly reconstructed The Big Park. 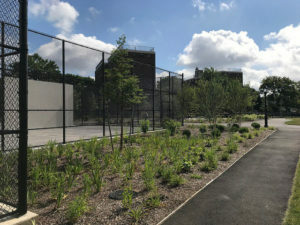 The Big Park is the fifth Community Parks Initiative (CPI) site to open on Staten Island after undergoing a $5.6 million reconstruction; with $3.3 million in funding from New York City Mayor Bill de Blasio, $1.3 million from the DEP and $1 million from Council Member Rose. 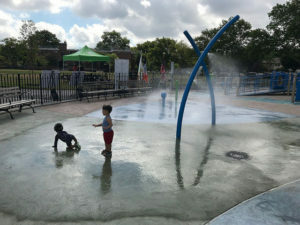 The Big Park has undergone a complete transformation and boasts improvements including, new spray showers and water fixtures, a fitness trail, remodeled basketball and handball courts, a redesigned landscape with more green space including a multi-purpose lawn for recreation, and new playground equipment with safety surfaces. Additionally, modeled after the Parks Without Borders initiative, there are lowered fences around the park to make it more inviting. In addition to these upgrades, The Big Park will open a redesigned comfort station in the fall. The park design is based on feedback gathered directly from the community at public input sessions. The renovated park also includes green infrastructure to manage storm water runoff, developed by DEP. DEP has committed approximately $50 million in funding for green infrastructure installations at CPI sites throughout the city, helping to reduce sewer overflows that sometimes occur during heavy rainfall, improve air quality and lower summertime temperatures. “DEP is proud to have once again partnered with NYC Parks to create another beautiful CPI site on Staten Island,” said DEP Commissioner Vincent Sapienza. 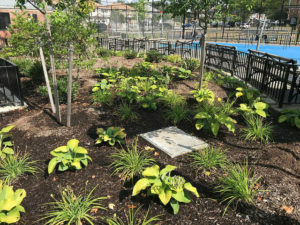 “The Big Park now contains seven rain gardens which will help capture an annual 1.5 million gallons in stormwater, reducing runoff into the sewer system and, thereby, improving the health of New York Harbor. I join with Parks Commissioner Silver in hoping everyone in Mariners Harbor enjoys this new, beautiful, green playground,” he continued. 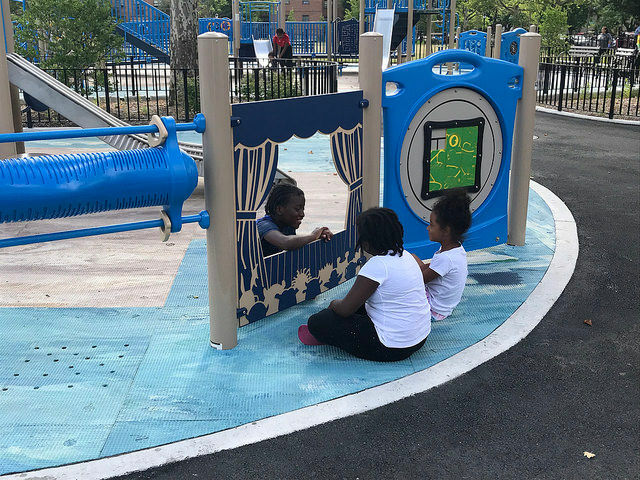 Launched by Mayor de Blasio in October 2014, CPI strives to make NYC Parks a more equitable and accessible parks system by investing in smaller parks that are located in New York City’s densely-populated neighborhoods with higher-than-average concentrations of poverty. Through CPI, the City is investing $318 million in capital dollars to make renovations to 67 parks citywide that have not undergone significant improvements in decades. All photos courtesy of New York City Department of Environmental Protection.